Today the information ecosystem is in a transition period. In businesses, people are shifting their focus to newer models of accessing data especially through the use of mobile and various wearable gadgets. Mobile and Internet of Things (IoT) strategy is increasingly becoming a part of sales strategy to innovate and sustain in this competitive world. Businesses are becoming versatile and social like never before and enterprises are on their toes to keep pace with the changing mobility and IoT landscape. With a focus on helping enterprises to grow, eBiz Solutions offers enterprise mobility solutions that enable communication for workforces spread across the globe. “Our enterprise mobility applications help increase our customers’ market share,” says Sridhar Sunkara, CEO, eBiz Solutions. The company has a good reputation in designing mobile strategy solutions for the clients. The company discovers where the client’s business stands on the mobile strategy journey and helps them to build according to the client’s business during its mobile transformation period. eBiz develops various types of mobile apps that integrate seamlessly with the customer’s enterprise landscape for efficiency and faster information. eBiz deep understanding about enterprise mobility needs and the respective data helps building Big Data and Analytics applications for enterprises. 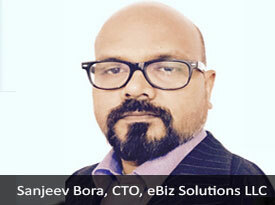 “Our communication system not only builds a strong bond with customers, but also promotes internal as well as external communication between the company and the customers that enhances their profits,” says Sanjeev Bora, CTO, eBiz Solutions. “The customers can also access complete mobile integrated solutions from any device and various platforms,” he adds. eBiz Solutions differentiates itself by its focus on innovation and LEAN methodology model. The company works customers, investigate their needs, wants and goals and accordingly design a mobile strategy which aligns with their goals. “We are always innovating and looking at new technologies, methods and frameworks” says Bora. This results in adapting to the recent technological trends as well as development of new comprehensive solutions which are validated and cater to the needs of the customers. “We align our own growth with the growth of our customers,” he adds. The company focuses on developing mobile solutions for enterprises which has need. Over the years, eBiz Solutions has helped many companies overcome their operational difficulties and adopt new trends. For instance, a SaaS-based CRM, company wanted their CRM Gadget to integrate into Gmail in order to give access to information in real time. eBiz assisted them and provided solutions on developing Gmail Gadget which brought CRM data directly into Gmail ecosystem and enabling user to manage CRM data and activity through Gmail. Another example where eBiz helped a security firm is by developing a mobile first technology interface and accurate guard tracking that provides transparency to clients on activities by the security company. eBiz’s foray into Internet of Things(IoT) helped few of their customers build data capture and notification management to various wearable gadgets along with companion mobile apps. eBiz Solutions plans to keep its focus on innovating and developing new solutions that cater to the market needs. The company is investing in IoT, Big Data, and building frameworks to rapidly provide solutions for tomorrow helping companies’ grow. A global technology and solutions company, delivering innovative product engineering, analytics, digital solutions, mobility , cloud, Internet of Things (IoT), Big Data and enterprise services.